Your fave products sized to travel from Weleda, Avon Anew, Tweezerman and Sephora! 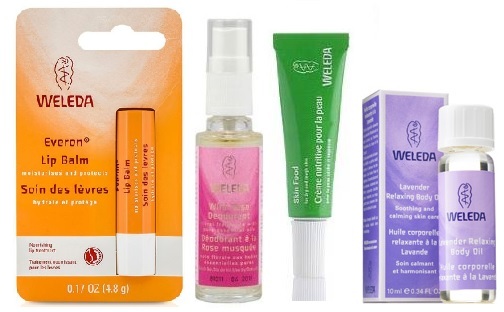 Everon Lip Balm - 4.8g - $10 - keeps lips soft and healthy with rose flower wax, vanilla planifolia and shea butter. Wild Rose Deodorant - 30ml - $13.25 - an aluminum salt free way to eliminate unwanted bacteria with organic wild rose and organic orange blossom. Skin Food - 30ml - $4.50 - a nourishing whole body cream with sunflower seed oil, pansy extract and rosemary leaf oil - perfect after a shower or a day in the sun. Lavender Relaxing Body Oil - 10ml - $4.50 - with a calming blend of lavender oil, sweet almond fruit extract and sesame oil that restores essential moisture balance to soften skin and melt away the stresses of the day. Available now at amazon.ca, well.ca, Whole Foods Markets and select independent natural health shops across Canada. Avon Anew Clean Mini Cleansers - 30ml - $6 - available are: Cream Cleanser & Mask for normal/dry skin - restores moisture to dry skin; Rich Cleansing Foam for normal/combination skin - balances skin by removing oil without stripping moisture; Gel Cleanser for oily/combination skin - helps eliminate excess oil for a shine-free look; Daily Scrub - exfoliates to visibly improve texture; Cleansing Water - cleanses, hydrates and tones with no water needed; and Toner - to condition skin. Tweezerman Brush IQ Mini Face Contour Brush Set - $45 - a must have set made with DuPont Natrafil filaments that feel like and perform better than natural hair fibers that includes a Mini Pointed Foundation Brush - glides around the natural curves of the face for precise coverage, Mini Contour Foundation Brush - with a unique angle that allows for seamless blending along the angles of the face making it perfect for blending and contour lines and a Blending Foundation Sponge - for flawless foundation application and fool proof blending - that work together or separately to help you achieve a perfectly sculpted makeup look and flawlessly contour the face. Sephora Confetti Set of 5 Mini Sponges - $15 - contains 5 uniquely shaped makeup sponges uniquely designed to buff into the smallest corners of the face, or apply a full face of foundation depending on the desired effect. They work well with liquids, powders, creams, and mineral pigments to provide sheer, buildable coverage. Each sponge allows for both detailed application - such as concealing and blending in hard to reach places - and smoothing and buffing product all over the forehead, cheeks, and chin.